A few years ago, I looked at the arguments for and against a tax on ‘fatty foods‘. Generally, I supported the idea of a tax on unhealthy foods because it is a way to price the full social cost of the good. It is an example of a Pigovian tax. A tax which internalises the external cost of the good. Recently, the Academy of Medical Royal Colleges has produced a report stating 10 factors that could help reduce the UK’s obesity epidemic. One of these is an experimental 20% tax on sugary soft drinks. A new study claims a 20 per cent tax on sugary drinks would reduce the number of obese adults in the UK by 180,000, bring in £276m to the Treasury and save the NHS millions. The logic behind the new tax. Higher price will reduce demand and make ‘healthier alternatives’ more attractive. Over time, the higher price may change peoples spending and eating habits. The sugary soft drinks create an external cost – of contributing towards obesity. Since obesity has external costs, the tax is making people pay the full social cost. It is the same principle as taxing petrol so people pay the social cost of congestion and pollution. You could also argue sugary soft drinks and other unhealthy foods are a demerit good. People don’t know (or ignore) the damage to health. Making them more expensive discourages the consumption of these demerit goods. If the tax is on volume, it may encourage people to enjoy smaller sizes. Then people can enjoy without drinking to excess. e.g. the free refill is a popular marketing tool, but encourages consumption to excess. But, could a tax stop free refills? It could raise up to £0.3 billion. This £0.3 billion could be used to lower other taxes, such as VAT or it could be used to increase spending on the NHS or specific obesity units. The Academy of Medical Royal College state that the obesity epidemic is contributing towards diabetes, heart disease and cancer and people are dying needlessly from avoidable diseases. The cost to the NHS of treating obesity related diseases is estimated to be around £5.1 billion per year (NHS). In addition to the direct costs there are many indirect costs, such as time lost off work, reducing incomes and output. Lost tax revenue from lower output and time at work. 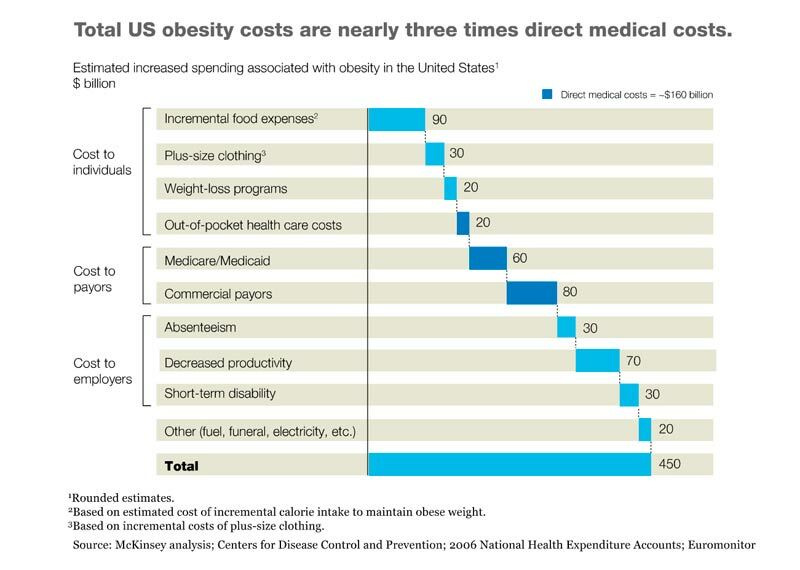 This report estimates obesity costs in the US. With total costs of $450billion, that is nearly three times the direct cost of $150billion. There is already food poverty. Increasing tax will take a higher % of tax from those on low incomes. This tax is likely to be regressive and increase inequality. However, sugary soft drinks are not a necessity – healthier drinks can be chosen. Also, in deciding the socially optimal price of goods, we shouldn’t be worried about equality. If we feel that taxing unhealthy food and subsidising healthy food increases inequality, there are always ways to overcome the inequality. Administration costs of putting tax on ‘sugary soft drinks’ There may be difficulties in collecting tax and deciding which drinks to tax, e.g. if you take sugar in your tea, does that make it taxable? But, it shouldn’t be too difficult to decide which drinks to tax. Even if every possible soft drink is not included, it should make a difference. Demand may be inelastic, and therefore the 20% tax has little effect on reducing demand. But, even small fall in demand for sugary drinks could have benefits. Overall, I think a sugar tax is an excellent idea. It will raise revenue and make people think twice before drinking soft drinks which contribute to the problem of obesity. Demand may be inelastic and it will not solve the problem on its own. But, the amount of deaths from obesity mean it is worth considering as many practical policies as possible. It is not by any means a panacea, there are many other factors causing obesity and poor health. But, it is worth taking these steps to help improve the nations health. This entry was posted in economics and tagged obesity, tax. Bookmark the permalink.